WASHINGTON (Sputnik) - A small US military plane crashed in San Antonio, Texas, on Tuesday, media reported. The KXAN television station reported on Tuesday evening that a T-6 Texan II military aircraft from the Joint Base San Antonio — Randolf crashed between Rolling Meadows Elementary and Veterans High School. Local TV KSAT reported that the plane had crashed in a grassy area. The two pilots in the aircraft ejected safely, the report said. The report also that the airplane crashed as a result of an engine failure. Joint Base San Antonio-Randolph officials later confirmed to the Military Times that the plane's crew members ejected safely, noting, however, that the pilots "sustained minor injuries." 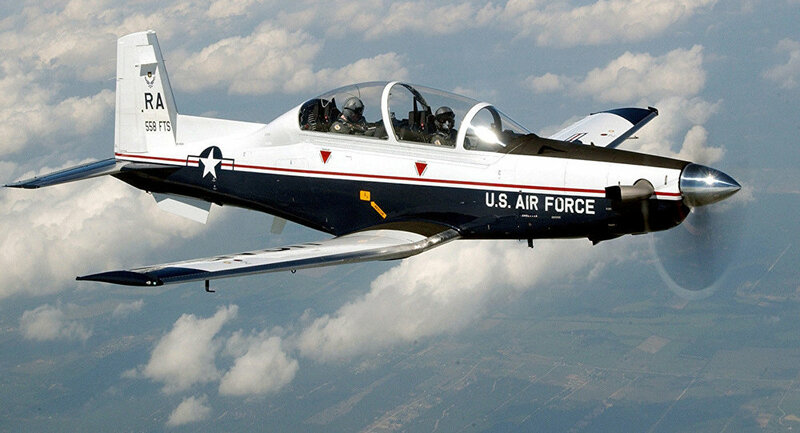 Previous week, another US training aircraft T-38 Talon II crashed at an Air Force Base in Wichita Falls, Texas. Both crew members sustained injuries, but managed to eject as well.